We are really happy with the bathroom vanity we purchased from paragon. They were extremely helpful when we had any questions, they were responsive when we called, the entire process was easy. The quality of the cabinets is exactly what was shown to us when we purchased the vanity, the timeframe was 8 weeks for a custom vanity cabinet, and the finish looks beautiful. I would recommend their services, we are planning on using them for our upcoming kitchen cabinets, using the same cabinet maker so we feel confident our kitchen will turn out as well as our bathroom. We highly recommend Elyse Hochstadt and the Paragon Kitchen & Bath Studio. 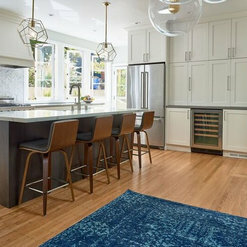 Elyse helped us with our extensive kitchen remodel/expansion, providing the design for cabinets, counters, tile and many smaller aspects of a complete kitchen remodel. She has excellent knowledge of the construction process and materials, often providing great suggestions on design and details. We found her ideas on colors especially helpful as we tried to make many different aspects work together. 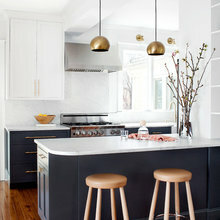 When we started out, Elyse asked us each to send photos of kitchens we liked, and when we met with her we saw that our “likes” were quite different. Elyse—with creativity, expertise, mindfulness of our budget, and fun—was able to draw on both of our personalities and preferences, and cultivate ideas to create a kitchen we love. Elyse is a great communicator, listening keenly and keeping in touch as needed. She was patient with our decision-making, but helpful in pushing us when needed. We found her to be flexible when we wanted to change pricing and style. She took the time to understand our preferences while providing excellent input on how different materials might work. 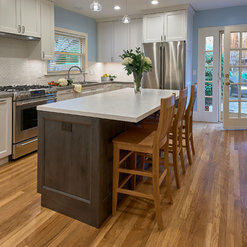 Cabinets are a BIG purchase during a remodel, so its important to get them right and that you are happy with them. Elyse worked well with us, the contractor and the architect to coordinate how the cabinet design worked with the plans and how to tweak the design when issues came up. And issues will come up, so it's important how they are handled, and Elyse always made accommodations and found solutions. We found Elyse and everyone at Paragon to be professional, knowledgeable and friendly. 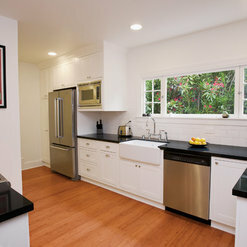 With Elyse’s guidance, our new kitchen is a beautiful expression of our tastes and needs. 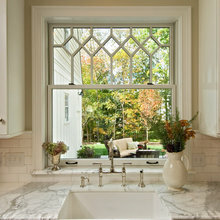 We wholeheartedly recommend Elyse at Paragon Kitchen & Bath. We so enjoy our family and friend’s excitement when they see our lovely kitchen and tell us “It’s beautiful and so you two!” Marie and Steve Munson. 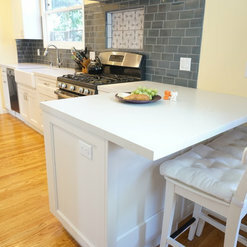 We did a total kitchen remodel with Paragon, and Elyse expertly guided us through every step of the process. She had great ideas and suggestions but also listened carefully to what we wanted and incorporated our feedback. Whenever decisions needed to be made, Elyse always took the time to sort through the options with us and provide thoughtful advice. The final result is both lovely and perfectly suited to our needs. The kitchen project went so well that we’re now using Paragon for our bathroom remodel as well. We highly recommend Paragon Kitchen & Bath and the outstanding service that they provide. Thank you so much, I really enjoyed working with you and developing solutions for you and your family's needs. I'm so pleased to see that the blue paint worked out and that your kitchen not only looks wonderful, but works for you. Can't wait to get started on the bath! 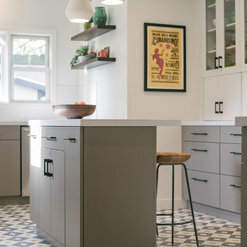 I worked with Elyse Hochstadt on a complete custom kitchen remodel this year and I highly recommend her! She was very knowledgeable about materials, helped me solve layout and function issues and was very accommodating with last minute changes. I am thrilled with the result! From our first conversation I believed Elyse would do a beautiful job. We were remodeling our kitchen to put the house on the market to sell. We wanted updated, functional and attractive. Elyse recommended her mid-level, Showplace, cabinets and her lower-end, Waypoint, for the connected laundry. 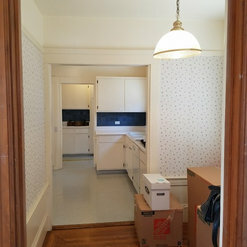 She worked hard to give us the quality kitchen we wanted within our mid-range ($65,000) budget. We also engaged her for design, trims & finishes consulting for an additional fee. Elyse was excellent in delivering her cabinetry products. The Showplace cabinets are beautiful. Smooth finish (white), delivered completely assembled. One cabinet arrived in the wrong size. Elyse handled that and the replacement showed up in time for countertop install. Even though we used her lower-end cabinets in the laundry, we are happy with them. Her low-end is still good quality, just not 100% plywood boxes. Every project has hiccups along the way. Ours was no different. During installation, measurements (which Elyse had very carefully taken) did not quite translate perfectly from drawings to reality as the floor height had changed - not Paragon's issue at all. It would have helped the project for them to have more of a team approach instead of "that's the contractor's job" response. To Elyse's credit, when I was unhappy with the depth of the upper cabinets, she was the height of professionalism. She was not defensive and really did listen. After I cooled-down, I apologized. It turned out that the cabinet depth was just fine. Her only comment was that we are all human. Nice and forgiving. I would hire Paragon again and do unreservedly recommend them. We are all human. 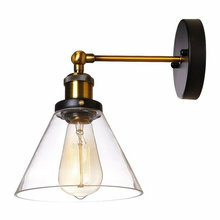 The products are high-end, Elyse's design sense is strong and the overall result is beautiful. 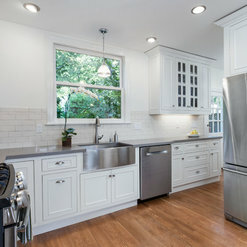 Cabinets, countertops and finishes are top-notch. Many thanks. Elyse was extremely helpful and extraordinarily patient in helping us to choose a new, full set of bamboo cabinets for our kitchen remodel project. She offered useful, no-pressure design ideas, helped us choose a cabinet manufacturer, and walked us through the minutia of far more decisions than we had expected. Then, when the manufacturer we eventually chose (which was NOT one of the ones she recommended) screwed up repeatedly on replacing a defective cabinet door, Elyse persistently went to bat for us making sure the problem was solved to our satisfaction. Although we're quite happy with the end result, with hindsight, we'd probably choose one of the manufacturers Elyse suggested. 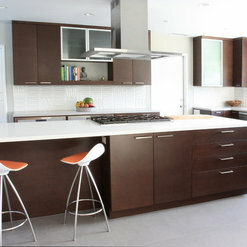 We were completely pleased to work with and highly recommend Paragon Kitchen and Bath. Maybe a "pro" could work with these guys but as a mere homeowner I had a very mixed and frustrating experience. The disconnect between design communication and install was abysmal resulting in my pricy kitchen cabinets being incorrectly installed. Basically Paragon was lazy about updating the design drawings to insure I had the correct copy to use for my install -- resulting in a very problematic and messy setup. Theyre response to me was "we dont recommend installers for this reason" of course the installer said the design was faulty (measurements were off) I get stuck with the bill and result. We hired Elyse at Paragon to design our kitchen and bath remodel, and she did a fantastic job. I would absolutely recommend her to anyone. Elyse is not only an expert designer, but she is a great partner during the process. She listens carefully to your ideas and what you want, whether they're well-formed or not. Just as you're getting overwhelmed with options, she brings you two or three great ones and helps you pick the best. She doesn't upsell and is happy to cut things if you can't afford them or don't want them. She never seems to forget anything and always follows through. Best of all, she was practically our therapist during an extremely trying and stressful time with our contractor, patiently listening to us vent and offering advice out of her own time. I cannot imagine a better partner. 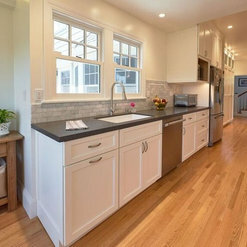 Our job was a full kitchen and bath gut on our '20s Oakland bungalow, down to the studs (and then some). We had a lot of moving parts, knocking out wall sections, all-new cabinets and appliances, floors, window, you name it. Elyse nailed every single detail down to the inch. She helped us custom-design a shallow cabinet/countertop for our funky door. She created our huge set of pantry cabinets around our fridge out of a few spitball ideas. She helped us make a custom hanging cabinet for cat food/treats with an under-cabinet hideaway water fountain. We have a wine fridge cabinet and a cat litter box cabinet. The details in our kitchen are amazing, and we have her to thank. Financially, Paragon may not be the cheapest option around (we spent a pretty penny on our fully custom cabinets), but it was the best money we spent on our whole project. At the beginning of this project, we weren't sure whether we needed a designer; the answer was unequivocally yes. We'll be recommending Elyse and Paragon to everyone we know. I'm speechless, thank you so much. Firstly you were amazing clients, great attitude and demeanor. I'm so so very happy that you are pleased with the outcomes. I wish you many happy years in your new kitchen and bath! 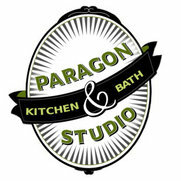 We are beyond delighted with our new kitchen and recommend Paragon Studio with total enthusiasm. 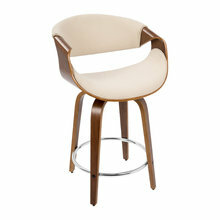 The level of design talent is exceptional and the service is top-notch. At every point along the way, Elyse and Rebecca were fully present and proactive, taking care of every detail. We had NO idea how much work was involved but thanks to the Paragon team the project stayed on schedule and we ended up with an even better design than we might have imagined. Thank you so much Kim. Your enthusiasm and involvement in the project made it such a joy. We're so thrilled with the end results and more thrilled that you and your family are delighted. From day one it has been a pleasure to work with Paragon Design. Thankfully I had a special relationship with Paragon and Elyse. Since I was gone during the entire kitchen remodel project, I ask her to oversee it, which she did exceptionally. My thoughts and Paragon's ideas and final design blended perfectly. The result was incredible. Just look at the pictures. I never dreamed such a transformation was possible. Thank you Mike! It was such a pleasure working with you, especially since you wanted to bring in the grandeur of the time into your kitchen - such a fun project! I'm so happy you're loving your new kitchen! - that's such music to a designers ears. It was my intention to create the most functional and fun space for you and your attention to detail, and understanding of what was necessary to have was so helpful in the process. Wishing you many many years of fabulous meals and great conversations in your kitchen! Commented: granite? 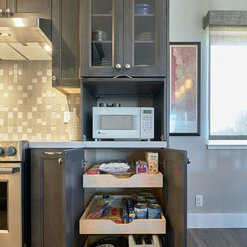 different type of counter with while cabinets. usually so whtI'm sorry I don't understand the question. Commented: Hood over stove?There is indeed a hood in there! Nice camouflage no? 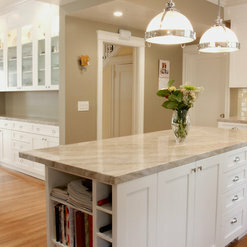 Commented: Countertop Material?Hi, isn't that a gorgeous top, it's Quartzite. It's natural stone so each slab is unique, Visit a local slab yard to chose your stone.